Viking announced its new 2020-2021 Viking World Cruise, which will span 161 days, six continents, and 75 ports, with overnight stays in 13 cities. Setting sail on December 14, 2020 from Miami, the itinerary will include six new ports of call for Viking, including Honolulu and Nawiliwili, marking the company’s inaugural visit to the Hawaiian Islands. Sailing on Viking’s 930-guest all-veranda Viking Sun, this grand voyage will allow guests to explore islands of the Caribbean and the South Pacific; call upon ports in Asia, from Hong Kong to Bangkok; explore countries of the Middle East, including Oman, Jordan, Egypt, and Israel; and sail through the Mediterranean before concluding in London. Guests can also choose a shorter, 140-day segment of the sailing, 2021 Viking World Discoveries, which departs from Los Angeles on January 4, 2021, and visits 27 countries and 66 ports. Viking’s newest World Cruise itinerary visits dozens of cities in one seamless itinerary. Overnight stays in 13 cities allow World Cruise guests to delve deeper into the destination, and Viking’s Culture Curriculum offers additional enrichment through onboard lectures and entertainment – such as Viking’s Resident Historian program, which provides guests with historical and cultural education specific to their journey. Oahu (Honolulu), Hawaii (NEW): The Heart of Hawaii: Guests can enjoy everything from historic landmarks to shopping on the island of Oahu. Soak up the sun along Waikiki Beach or visit Pearl Harbor to see where the events of December 7, 1941 unfolded. Kauai (Nawiliwili), Hawaii (NEW): The Garden Island: Nicknamed Hawaii’s “Garden Island,” guests will explore the vegetation and wildflowers of Kauai while in port. Visit the Na ?ina Kai Botanical Gardens & Sculpture Park, an infusion of flora and art and home to one of the largest collections of bronze sculptures in the U.S., or follow the footsteps of Captain James Cook, the British explorer credited with the first recorded European contact with the Hawaiian Islands. Moorea (Opunohu Bay), French Polynesia (NEW): Paradise in the Tropics: This tropical island is famed for its beauty and its cuisine is as colorful as its landscape, drawing on influences from both European and Chinese settlers. Guests can take in this island from the water onboard a catamaran or immerse themselves in Polynesian traditions and customs by engaging with locals. Hue (Chan May), Vietnam (NEW): Palaces and Temples: Discover the ancient Imperial City of Hue, a repository of palaces and temples and seat of the Nguyen Dynasty for 150 years. Guests can experience the locals’ morning trading activities during a visit to a traditional food market or explore the crumbling stone walls of the citadel, which holds stories of long-fought battles. 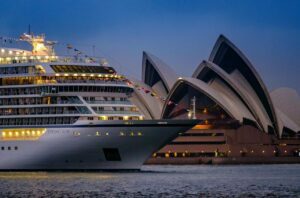 Sydney, Australia: Iconic Harbor: Guests will sail into Sydney’s harbor and enjoy an overnight stay allowing ample time to explore this culture-rich city. Guests can enjoy an insider’s view of Australia’s opera house or experience the natural wonders of the nearby Blue Mountains. Mumbai, India: A City of Old and New: Formerly Bombay, the bustling city of Mumbai is the financial, commercial, and entertainment capital of India. While in port, guests can learn about the activist Gandhi or enjoy the Hanging Gardens, one of the parks found in the city. Istanbul, Turkey: Where East Meets West: An overnight stay in Istanbul gives guests more time to experience this historic city that straddles two continents across the Bosporus Strait. Explore religious sites such as the Blue Mosque or the Hagia Sophia, or sample fusion cuisine, combining Mediterranean fare with spices from the Far East and Asia. London (Greenwich), England: The Royal Borough: Guests will end their sailing in the historic Royal Borough of Greenwich, London on the Thames River, allowing easy access to the capital’s sights, including the Tower of London, Houses of Parliament, Big Ben, Westminster Abbey, Buckingham Palace, and St. Paul’s Cathedral.